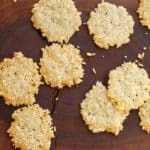 Parmesan Pepper Crisps are an easy way to fancy up your cheese plate, a quick elegant appetizer for your holiday entertaining or just a good snack! In a large mixing bowl, stir ingredients together. Line two baking sheets with silicon mat or parchment paper. Spoon 1 tablespoon cheese mixture into mounds, 12 to a sheet. Transfer to cooling rack. Store in airtight container.